When designing this local kitchen, we opened the space to invite in natural light with a vaulted ceiling and large windows and skylights that faces the river. This view of the kitchen space shows a large island with bar height seating to accommodate guests without inviting them into the work space. Simple shelves, sleeved between the glass backsplash panels, give a clean, minimalist look to the main kitchen area. Ample storage is extended out of the initial view of the kitchen using stainless steel and frosted glass cabinetry. The black walnut finish of the island and lower cabinets anchor the kitchen while the lofty vault ceiling gives an open, airy feel. The kitchen: the heart of the home, according to many. We tend to agree. After all, the kitchen is the first room we visit each day to brew our coffee, where we chit-chat with family after a long day apart, and where we prepare our meals. It serves as the main hub of the house as we pass through countless times each day - packing lunches, unloading groceries, or sneaking a midnight snack. In a world overwhelmed with stuff, overloaded with information, and obsessed with being busy, it’s refreshing to see all the recent buzz around minimalism. As an architect who specializes in modern design, the world is catching on to what I’ve known and practiced for 30 years: minimal, intentional, sustainable living and design. There are many benefits to modern design, especially in the kitchen. For example, a modern, minimalist design strives to effectively hide or blend appliances and create ample storage space to keep visible areas, like countertops, clutter-free. Less clutter equals less stress. It also provides more space to simply keep clear, or intentionally fill with a vase of your favorite flowers or a special keepsake that brings you joy. We see it over and over again - the top requests for kitchens are: efficient work space, plentiful storage, and a barrier between the functional kitchen space and the area our guests hover to chat and drink wine. Herein lies the reason to work with an architect and/or design team for your remodel or new build. Achieving the desired functionality and aesthetic for your unique family can be tricky without the help of a professional. After all, the ultimate goal of architects and designers is to ensure the complete personalization of your space is complimented by optimal performance. If you’re considering building, working with an experienced architect is critical to the process. Embracing and tailoring your home to the natural landscape of the site will add so much to your living experience and to the value of your home. Where the sun rises and sets, and how the natural light enters, should guide the placement and layout of your home - especially your kitchen and living spaces. Ask yourself: what is the most spectacular view and what space in your home do you wish to observe it from every day? Clients and acquaintances alike frequently ask, “What are the most important things about kitchen design?” The three most important things to focus on are: the placement of appliances (envision the dance between the refrigerator, oven, and sink), creating ample storage space, and using quality, sustainable materials. We want to leave you with five easy tips and action items to prepare you for working with an architect and/or design professionals. Anything you absolutely do NOT want? (Colors, textures, finishes, etc.) List them. Know yourself and your family. How do you currently use your kitchen space? List the ways you use it now that you’re guaranteed to need it for in the newly designed space. Take plenty of time to consider how you want to use the space. What’s your intention for the space? What are your main goals? What are your favorite things to cook or bake? Having a clear understanding of what you want from the space will help your architect and design team strategically lay out your entire kitchen space and add helpful extras (like stove faucets). There are countless elements to the design process - don’t go at it alone. 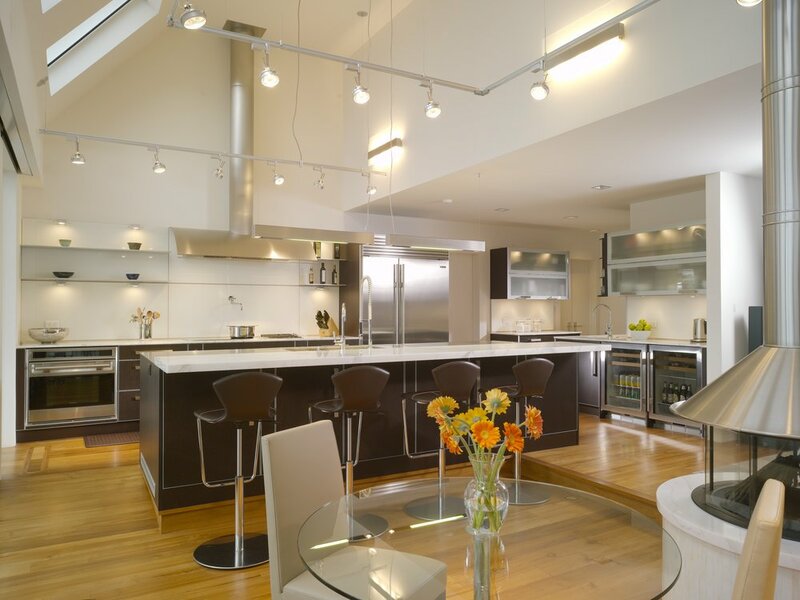 Hire a design professional to help you create your ideal kitchen space and home. Contact us today to talk about your dream kitchen (or dream home!) plans. This kitchen features Brazilian teak floors, Calacatta Gold marble and stainless steel countertops, painted glass backsplash, a beverage center, and upscale stainless steel appliances including a subzero refrigerator and extra sinks and ovens. Want to see more? View a feature about this gorgeous kitchen in Trends.